Great for autumn appetizers or fun mini meals, these tasty Apple Cheddar Sliders won’t last long on your plate! 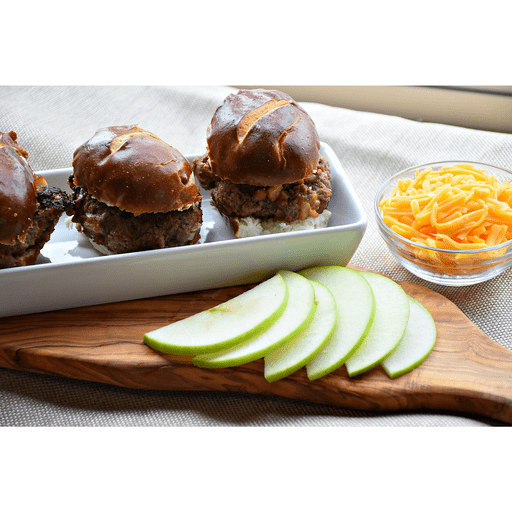 Filled with fresh apples, caramelized onions and sharp cheddar cheese, these sweet and savory sliders are a great way to transition with the changing of the seasons. 1. Pre-heat broiler or stove-top grill. 1. Coat a medium frying pan with cooking spray. Add diced onion and apple. Sauté over medium heat until soft, about 6 minutes. Set aside to let cool. 1. In a medium mixing bowl, mix together lean ground sirloin, cheddar cheese, 1 ½ Tbsp. Dijon mustard and cooled onion and apple mixture. Once mixed, form 12 small slider patties. 1. Broil or grill for 8 minutes or until done. 1. Spread remaining 1 ½ Tbsp. Dijon mustard on mini buns and top with cooked burger. Serve immediately. For those with a little heartier appetite, easily transform these bite-sized delights into fall-flavored quarter-pounders by simply increasing the size of the patties and cooking a little longer to help ensure that they are cooked to perfection. Don’t have slider buns? Use hot dog buns instead. Cut hot dog buns into halves or thirds, depending on their size, and stuff like you would a slider bun. For dairy free: Use cheddar-style shredded cheese substitute. For gluten free: use 4-6 gluten free hot dog buns. Calories 350, Total Fat 14g (Saturated 6g, Trans 0g), Cholesterol 60mg, Sodium 500mg, Total Carbohydrate 33g (Dietary Fiber 3g, Sugars 9g), Protein 22g, Vitamin A 2%, Vitamin C 6%, Calcium 10%, Iron 15% *Nutritional values are an approximation. Actual nutritional values may vary due to preparation techniques, variations related to suppliers, regional and seasonal differences, or rounding.